The first few days of gardening with this have been a learning experience, that's for sure! For each recessed bed, I smoothed out the basin area (the bottom), poured a little water on it, and pressed down the top soil with a flat stone. What can I say, I'm trying to be a traditionalist about this. As well as being lazy and having my son point out a big, flat river stone sitting next to me just when I needed to flatten the beds. It came together at the right moment, is all I'm saying, and now I'm fond of that flat rock and he sits in a place of honor on a shelf outside with my garden tools. I think I'll call him Bob. Anyway, I let the dirt dry completely before I tried to plant and this made a crust of harder dirt on top of the bed. To plant a seed, I had to punch through that crust to get the seed in, so I needed a little tool to make the hole. I wasn't expecting that! 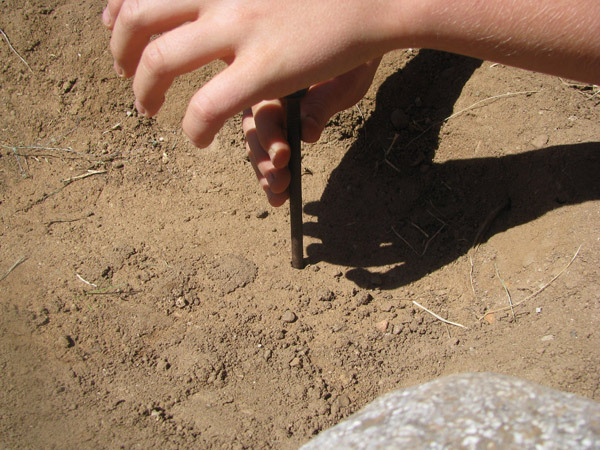 Usually I'm just poking my finger into soft dirt that I've just dug up, but with the crust, that just wouldn't cut it. I ended up using a big ole spike-nail thing that I found in my yard last year and have had hanging around. It worked perfectly, although a stick would work just as well, I think. Anything with a sharp point and the right width. Although something I hadn't considered before was how to cover the hole back up when all the surrounding dirt is rock hard! I either crumbled the edges of the hole into itself, which didn't always work, or I added a little dirt from outside the waffle garden into the hole. I liked this latter method best, but you have to add just a few drops of water afterward and press it down. Otherwise, when you water, the dirt and the seed can come floating up into the water and end up laying on top of the dirt! Because I had some time to spare in between planting the first few squares of the garden and all the rest, I thought I'd use a tiny bit of knowledge I had heard about seeds and planting and just apply it all across the board with no actual research. I tend to do that. What I'd heard is that if you want a plant to sprout sooner, you can soak the seeds ahead of time and let them sprout before you plant them. I thought I'd just see what happened when they sprouted, if there was any difference, if it was actually faster. And woah baby, was it! 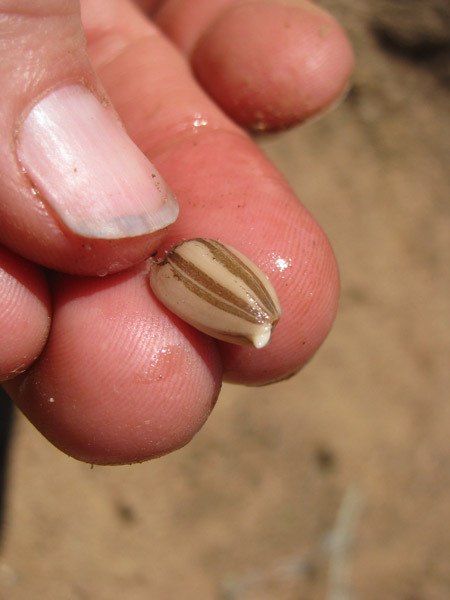 Although the unsoaked seeds came up quickly too. My first sunflower came up about 8-10 days after I planted it (okay, yeah, so I lost track a bit, whoops!). My first sprouted sunflower came up maybe 4 days after I planted it, just 2 days after its earlier neighbors! It was pretty darn amazing! So far, in this garden I have planted sunflowers, beans, squash, native safflowers, tomatoes, tomatillos, onions, basil, oregano, sage, nasturtiums, and marigolds. I also have two tri-colored sage herbs transplanted and possibly some sage seeds as well - I kind of forgot to label one batch of soaking seeds, so it may have been sage. >_< Some of the sunflowers, beans, squash, safflowers, tomatoes, basil, oregano, and nasturtiums were soaked for a few days, as well. Some of the sunflowers and safflowers have pushed through the soil. In the squares, I planted a sunflower or two in the middle with beans surrounding them and squash in one or two corners. The marigolds and nasturtiums were planted along the outside edges or corners of the squares. Each square without tomatoes got one onion, plus a couple of the squares with tomatoes, as well. My theory is that the onion can help hide the smell of the plants sometimes from the bugs. I think I've read this before but I wouldn't swear to it. However, my plants near my onions tend to survive more than the plants away from the onions, so I'll continue to use them for the moment! Unfortunately, I don't know that it works so well on furry critters. I try to keep a lot of native plants in my yard, including those that are homes for birds, provide seed for birds, or have both very small or very large blooms for pollinating insects. 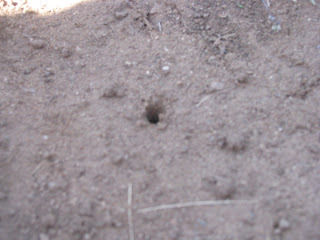 I have a section of the yard with lots of wild grass that is very snake friendly, to keep the packrat population down. I also companion plant with herbs and flowers that have strong smells that might confuse or distract from the garden plants, or convince predatory bugs to come by for an insect snack. So far, I have had very little trouble with bugs eating all my crops. A few losses here and there, but nothing too bad. Even the furry critters are not too bad, barring the pack rats. The few rabbits that come in nibble on a few plants at the edges of my garden - I often leave a few there as a sacrificial offering, if I can - but they tend to leave the rest of my garden alone. The packrats, well, if they find my garden, they're a problem. Let's hope this year they won't, because I'm not putting up fencing. Right now, I do face danger from bugs with my new sprouts. So, after I've watered, I pick a native weed or two to drape over my sprouts and hide them. I figure they will be physically hidden as well as hidden by the smell of a native plant that is not being eaten by the local critters (I choose my weeds carefully). It's only been a few days and so far, the seedlings are doing well, with only one sunflower lost before I covered it. I'm crossing my fingers that more will come up. It's one of the reasons I plant a few extra seeds, anyway. I am also experimenting with something that I hope might keep the furry critters away from the smaller sprouts, anyway. It's a kind of weed warfare. I have quite a few of these nasty, spiky little weeds, with thousands of small, irritating hairs all over them. I was pulling them out of a path and I thought: I could use this. So I covered about half of my waffle squares with a mulch made of grass and these fuzzy/thorny weeds. I covered four squares with just grass, and then left one square of safflowers, one of squash and beans, and two of tomato bare. I'll drape a few weeds over their new sprouts, but that's it. 1. If the spiky weeds deter any more critters than the grass or a few strategic weeds does. If I'm lucky, the burrs are just as irritating to rabbits, packrats, and ground squirrel noses and mouths as they would be to human ones. Although for packrats, I don't have a lot of hope. 2. If the spiky weeds are okay for mulch. They could have some chemical that discourages competition and retard the growth of my crops or something. 3. And if the mulched crops retain water significantly more than the crops without mulching. ...yeah, my experimentation always gets a bit out of hand, so I've got so many things going that by the end, I can't tell what's happening. But it's fun, and I can at least explore a lot of ideas this way. Pollination has been more of a problem in the recent past. I planted sunflowers and the vast majority of the flowers were never pollinated. This year and next, I'm trying to get more native bees to come by, using techniques I've mentioned here. More on how the watering and sprouting is going in the garden, next time.